This paper is sort of a preview of what is going to be a large series of empirical papers on pig genomics from a lot of people in our group. The humble CD163 gene has become quite important, because the PRRS virus exploits it to enter macrophages when it infects a pig. It turns out, that if you inactivate it — and there are several ways to go about that; a new one was even published right this paper (Chen et al. 2019) — you get a PRRSV-resistant pig. For obvious reasons, PRRSV-resistant pigs would be great for pig farmers. In this paper, we wanted to figure out 1) if there were any natural knockout variants in CD163, and 2) if there was anything special about CD163 if you compare it to the rest of the genes in the pig genome. In short, we found no convincing knockout variants, and that CD163 seemed moderately variant intolerant, under positive selection in the lineage leading up to the pig, and that there was no evidence of a selective sweep at CD63. You can read the whole thing in GSE. Figure 1, showing sequence variants detected in the CD163 gene. If you are so inclined, this might lead on to the interesting but not very well defined open question of how we combine these different perspectives on selection in the genome, and how they go together with other genome features like mutation rate and recombination rate variation. There are some disparate threads to bring together there. Johnsson, Martin, et al. 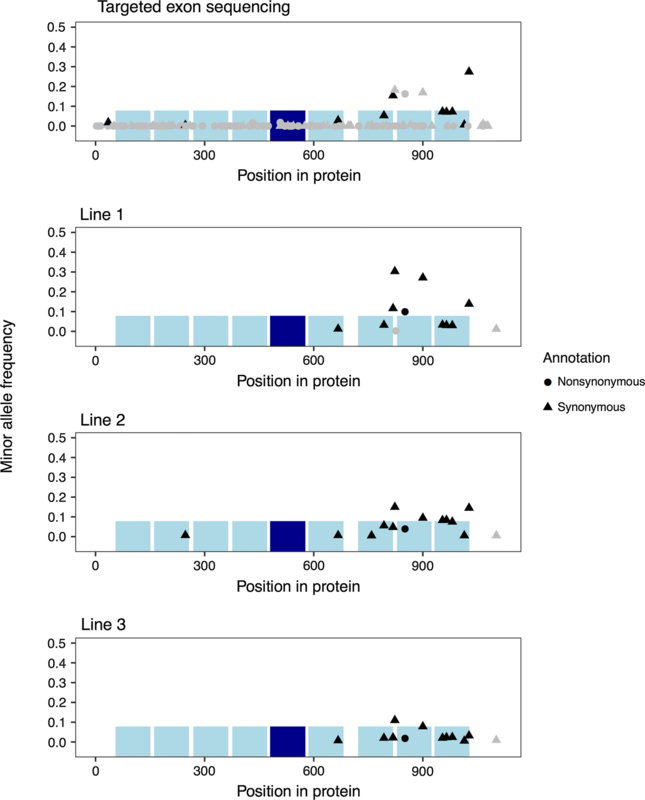 Sequence variation, evolutionary constraint, and selection at the CD163 gene in pigs. Genetics Selection Evolution 50.1 (2018): 69.